The singing and orchestra playing in Un ballo in maschera (A Masked Ball) are wonderful. The production is not. This is becoming an all-too-familiar dichotomy at the Canadian Opera Company. Opera is, after all, the first modern form of music theatre. The COC has increasingly moved the music side of the term to higher levels of perfection, while far too often choosing productions that make nonsense of the opera as cogent theatre. That is exactly what happens in the current Ballo, a 2008 production from Berlin’s Staatsoper Unter den Linden directed by Jossi Wieler and Sergio Morabito. Un ballo in maschera (1859) is based on the libretto to an earlier opera Gustave III, ou Le bal masqué (1833) by Daniel Auber. Auber’s opera was inspired by the assassination in 1792 of King Gustav III of Sweden while attending a masked ball at the Royal Swedish Opera house. The censors first in Naples then in Rome did not approve of depicting the political assassination of a noble on stage and requested changes. After relocating the action to Pomerania and demoting the king to a duke did not please the censors, Verdi’s librettist decided to shift the action to Boston in the 17th century and make the assassin’s target the Earl of Warwick, a fictional colonial Governor of Massachusetts. In the 20th century the original Swedish setting became popular again and now directors have two settings and two sets of character names to choose from. Wieler and Morabito have decided to go with the American setting, but they have moved the time from the 17th century to the 1960s and the place from Boston to an unspecified location in the American South. The 1960s were, of course, a time of many assassinations in the US, so the updating theoretically is pertinent. den Linden is about twelve feet narrower than the Four Seasons proscenium so that six feet of legs have been added to each side of the set mask the gap. This means that a third of the audience, those seated house left, will be unable to see this stage-upon-the stage. Fortunately, nothing important ever happens there, or indeed in the entire back half of the set, making one wonder why so much space was wasted. The ballroom set, unsurprisingly, only works for the final scene that takes place at the masked ball of the title. When Riccardo, Conte di Warwick, who is dressed more like a college student than a state governor, leaves his palace to seek out Ulrica the fortune-teller, he exits the ballroom only to return to find her sitting six feet from where he had been. Ulrica tells Amelia to pick an herb that grows on the outskirts of town where criminals are hanged, but those outskirts also happen to be in the same ballroom and the rare herb is apparently growing among the potted ferns beneath where Ulrica herself has been hanged. We know that Wieler and Morabito are not pretending the indoor set now represents the outdoors because Amelia enters wearing a nightgown and her husband Renato later enter in his pajamas and slippers. To render what is supposed to be a frightening scene totally ridiculous, when the gentlemen of the court enter pursuing Riccardo, they, too, are all clad in pajamas and slippers. Rather than conjuring up the tensions of the 1960s, the general bad taste on display simply trivializes the action. Wieler and Morabito are not content merely to change the setting but also the dramatis personae. Oscar, Riccardo’s page, is normally a trousers role. Here he is played by a woman as a woman, whom the directors describe as “a young performance artist” whom Riccardo uses to “maintain contact with the youth culture scene”. Given that we never see Oscar in touch with youth and that Anja Rabes has costumed her to look like the modern Icelandic pop singer Björk, her presence is an anachronism within the 1960s setting. The directors at first present her as a kind of magical stage manager figure during the overture with the power to turn on lights and move curtains just by gesturing at them. After the overture she apparently loses these powers. Riccardo and the court decide they will go in disguise to visit Ulrica, but Wieler and Morabito have decided Ulrica is blind. They have her wander about arms outstretched as if in a 19th-century melodrama. White canes for the blind were introduced in the US in 1930 so why doesn’t Ulrica have one? In any case, Verdi’s Ulrica tells fortunes by reading palms. Wieler and Morabito try to get around that by having her do her “readings” by dangling the handle of a hotel room key over the palm. After Riccardo pardons her in Act 1, we see her hanged in the ballroom in Act 2. But by Act 3 she is alive again wandering around the hotel and no longer blind. The symbolism escapes me. Finally, Wieler and Morabito have given Riccardo a wife. Since the character is not present or even referred to in the original, the actor playing the role has nothing to sing or speak. Her presence becomes extremely problematic at the conclusion since, after Riccardo is shot, she cannot rush up to him as any normal wife would but has to wander about waiting for Riccardo and his beloved Amelia to sing their last goodbyes, before she can go up to Riccardo, by then already dead. One suspects the main reason she has been added is to allow designer Anja Rabes to make her look as much like Jackie Kennedy as possible, pillbox hat, gloves and all. As a final statement that the directors’ views are more important than those in the opera, only six people, including Riccardo and Amelia, show up at the masked ball wearing masks. Riccardo and Amelia soon discard their flimsy paper half-masks, while Renato’s sunglasses are supposed to be his “mask”. This, of course, makes nonsense of the original concept of the opera and of the dialogue among the conspirators about how to discover which of the guests is actually Riccardo. The current production would receive very low marks were it not for the extraordinarily high level of the music-making. Adrianne Pieczonka is positively radiant as Amelia and invests every phrase she sings with a fierce emotional intensity. Her voice is strong and rich throughout her entire range, her sotto voce passages are exquisite and her ability to lend colour and nuance to her words in unparalleled. 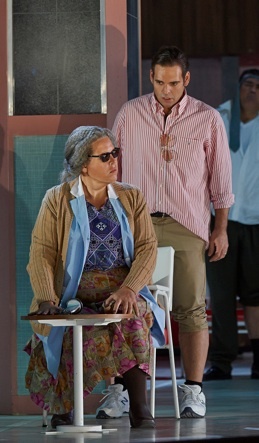 As Riccardo, Dimitri Pittas has a youthful, fine Italianate tenor and an unlimited amount of lung-power. He can’t match Pieczonka in differentiating the various emotions of his arias, much less in shading his words, but he is so young and so bright that surely will come with time. 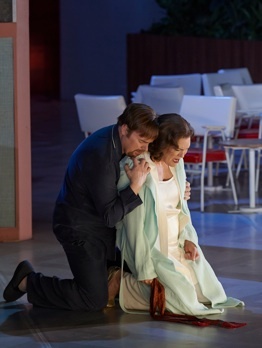 As Renato, Amelia’s husband and Riccardo’s trusted advisor, baritone Roland Wood gives a magnificent performance. He wields his huge, rich voice with intelligence and emotion and succeeds in making Renato the opera’s most interesting character. Simone Osborne is spritely as the new version of Oscar. Her upper notes soar, but her lower notes tend to get lost in the orchestra. Elena Manistina lends Ulrica a much-needed eeriness, especially since she is dressed as a retired hotel maid. She has a commanding presence and creates tension with her vehement imprecations and her reluctance to foretell Riccardo’s doom. Gregory Dahl as a Silvano, here a Vietnam veteran, and Evan Boyer and Giovanni Battista Parodi as the two conspirators all make memorable contributions. Conductor Stephen Lord sets the COC Orchestra ablaze with an impassioned account of the score. When this production of Ballo premiered in Berlin, even fans of Wieler and Morabito admitted its was not the duo’s best work*, and reviewers reported that the Staatsoper audience gave the directors a very unfriendly reception†. In 2011, COC General Director Alexander Neef gave us Christopher Alden’s Rigoletto, a production so disliked by the Chicago public that it was deemed “unrevivable”. Now with Ballo he gives us another production disliked by the public who first saw it. One has to wonder what possible benefit there can be to an opera company in presenting productions that the public elsewhere has already booed. Photos: (from top) Adrianne Pieczonka,Dimitri Pittas, Roland Wood, Simone Osborne (in swan dress), Evan Boyer and Giovanni Battista Parodi; Roland Wood and Adrianne Pieczonka. ©2014 Michael Cooper.